Kobelco Cranes Co has officially opened its Global Parts Centre in Singapore which started operations at the beginning of this year. The opening ceremony was attended by Akihiko Tsukamoto chief executive of Kobelco Cranes together with senior company executives, dignitaries, Kobelco dealers, business partners and associates. The new centre is strategically located to supply both the Asia Pacific and Australasia region as well as Europe, Africa and the Middle East, from a single location. The initial stock holding is valued at ¥400 million ($340,000) and will be expanded to¥ 1 billion ($850,000) by 2020. The opening ceremony included a reception on Thursday at the Grand Copthorne Waterfront Hotel, with chief executive Akihiko Tsukamoto and other members of the senior management team officiating. The function was also attended by Mike Lee, senior manager of International Enterprise Singapore and other dignitaries. 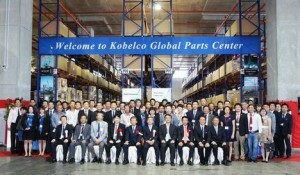 “The Global Parts Centre in Singapore can supply the parts within 36 hours after confirmed order and as a result we are hoping to increase our parts sales of 1.3 billion JPY ($11 million) in 2014 to 2 billion JPY ($17 million) in five years,” said Toshiyuki Hiromitsu, head of customer support for Kobelco Cranes. Kobelco is increasing its parts stock in Kobelco Global Parts Centre to 400 million JPY ($3.4 million) in 2015 and is planning to expand to 1 billion JPY ($8.5 million) by 2020. I just want to mention I’m newbie to blogging and site-building and truly loved this website. More than likely I’m going to bookmark your site . You actually come with fantastic well written articles. Thanks a lot for sharing with us your website page.